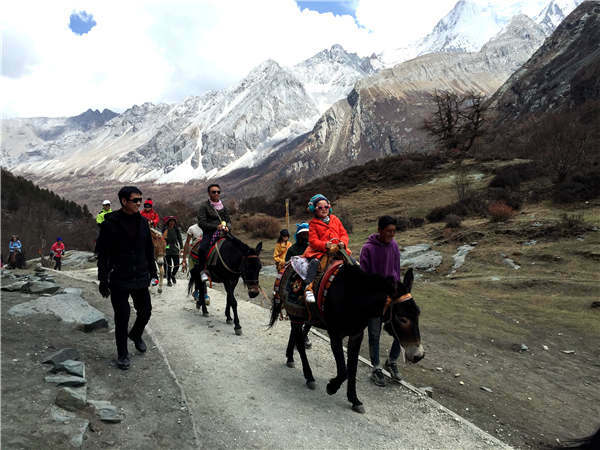 Running and hiking enthusiasts heat up local tourism in Yading, Sichuan province. An international cross-country running event has put Yading on the map of tourists worldwide and brought significant changes to the lives of locals. Held during the recent Labor Day holiday, the cross-country running event was a joint effort between the local government, Chinese company Migu Run and Italy-based International Skyrunning Federation. The event attracted more than 1,000 participants from 25 countries and regions. "The number of participants who had signed up was more than what we expected," says Li Panpan, who works for the event organizers. The event featured two race routes measuring 46 and 29 kilometers as well as climbing and hiking experiences that took place between 2,900 and 5,000 meters above sea level. Casal Mir Oscar from Andorra won the 29-km race in three hours, six minutes and 26 seconds. Holly Page from the UK was the first female runner to complete the race in three hours, 32 minutes and four seconds. Chinese contestants Jiaer Renjia and Yao Miao topped the 46-km run for the men's and women's categories respectively. For many of the contestants, winning wasn't on the agenda - they were content to just take in the magnificent scenes of nature. Chen Xia from Beijing, who opted for the 29-km race and a 10-km hike on the side, was one such individual. Visitors hire horses and donkeys as transport.